EBay has partnered with Argos to launch a trial click-and-collect service in 150 physical stores as it follows in the footsteps of Amazon. The click-and-collect trial will rival the lockers being used by Amazon in the UK and is available to 50 large merchants. It will launch before the end of the year. John Walden, managing director at Argos, said: "Customers are finding click and collect more convenient and more personal. A number of activities including locker experiments reflect that fulfilment is moving to become more local and more personal." EBay has chosen to launch a click-and-collect trial to take advantage of a boom in popularity of the service, citing an Econsultancy online shopping survey that revealed 40% of shoppers used click and collect over Christmas 2012. Jacob Aqraou, senior vice-president of eBay EMEA, denied the trial is being rolled out to take aim at rival Amazon. He said: "It is not a deliberate thought,. What we’re focused on is following consumer trends. I expect Amazon came to the conclusion in the same way." The news comes after Marketing revealed Argos was hiring a design agency to create a "digital retail store of the future" concept to ward off pressure from Amazon. 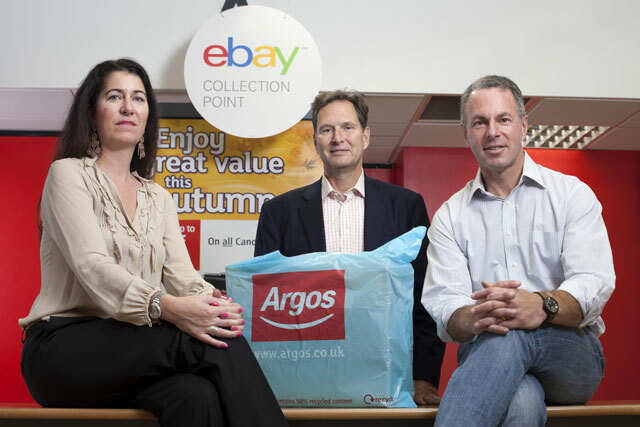 The click-and-collect trial will include an eBay-branded corner appearing in the 150 Argos stores that are taking part in the trial, out of a total 735 Argos stores. EBay will also advertise the new service on its site as users go through the payment process and Aqraou added there will "almost certainly be a marketing campaign" to support the trial. Aqraou added that eBay had not yet thought about partnering with other high-street retailers for a click-and-collect service. EBay is also set to overhaul its UK website before the end of the year and will launch its one-hour delivery service in Europe, which will begin in London at the beginning of next year. The eBay Now service allows an item to delivered to a device, rather than just an address, within one hour of ordering. Devin Wenig, president of eBay, said: "Later this year we will begin to roll out even bigger changes to the website. These will include social interaction, personalisation and curation. We believe we will offer the most engaging experiences anywhere on and offline." Christmas: time for marketers to remove their blindfolds?